Angie, like Franklin, is another significant character from Multiplex who only gets a brief cameo in the pilot episode. 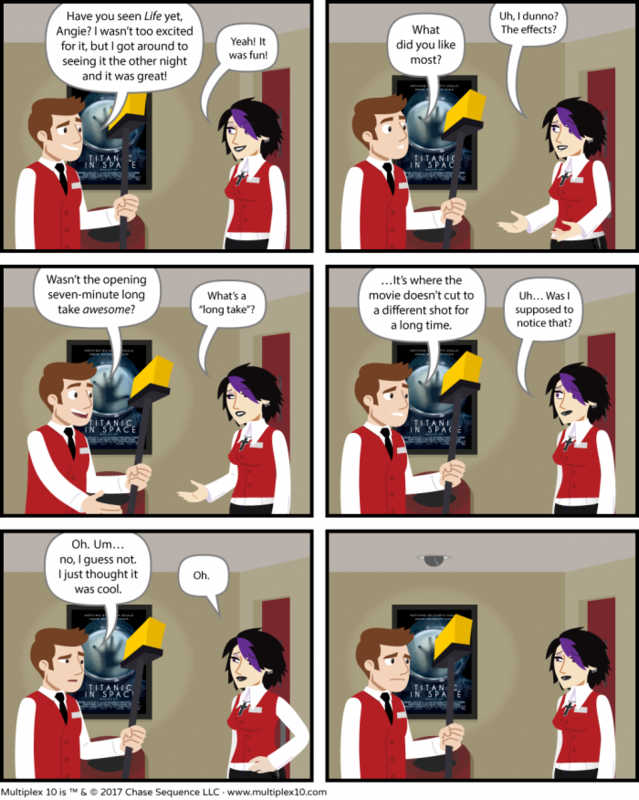 So here she is in a Multiplex 10 comic strip. Also, in case you missed it, there were a couple of new… uh, I’m not sure how to refer to them. “Promo comics,” I guess? The Multiplex 10 versions of Melissa & Becky and Franklin introduce themselves and talk about the animated short and one of the Kickstarter milestones, like the Kurt & Jason one I posted here a while ago. I posted those around the social medias and the separate, Multiplex 10-specific site, which some of you may not know about. If you’ve seen the rough animatic of the first scene from the animated short (which I posted both on Patreon and in the Kickstarter updates), you know that the episode begins before Jason has started working at the Multiplex 10. 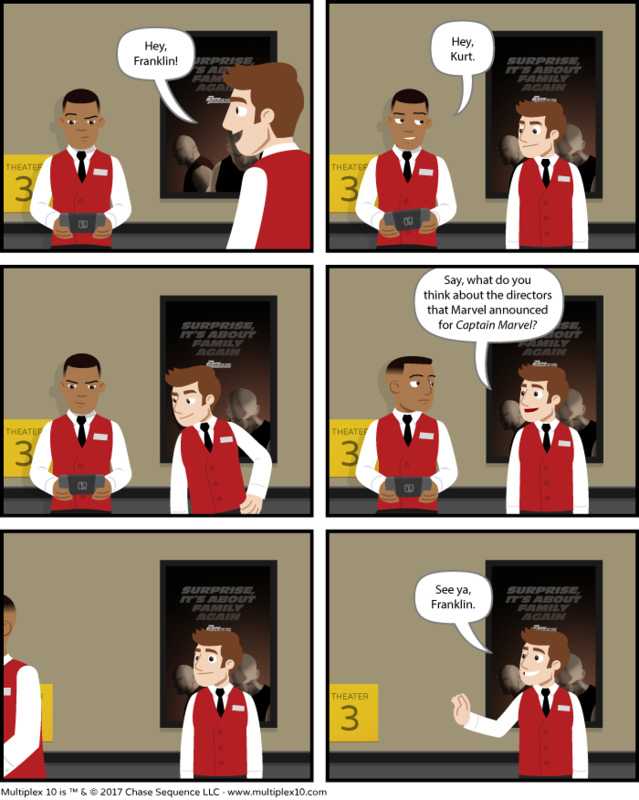 So here’s one difference between the Multiplex 10 “universe” and Multiplex (comic strip) canon; Franklin started at the theater before Jason does. Also, the movie poster frames aren’t red anymore, because their vests are red, that was a really stupid decision, and I should have changed it ten years ago. I feel bad that Franklin only has a small cameo in the first episode, especially since I already know who I want to voice him (hi, Terrence). Sadly, a lot of things that factor big in the comic won’t turn up in the first eleven minute episode, because it focuses on Kurt and Jason. But hopefully we’ll get to make more. And even if we can’t, I’ll still want to make some mini-webisode sort of things and maybe a digital comic (e.g. Comixology Submit style)… and, of course, there’s also a tabletop/card game in development. So, like I’ve said, I’m not done with these characters yet. Hello! The Multiplex 10 Kickstarter project ends in just over 14 days. As of this writing, we are a little north of $12,000, so just over 80% of our base goal. Judging from my last two Kickstarters, we’re doing very well. The final week should pick up considerably over this past week. 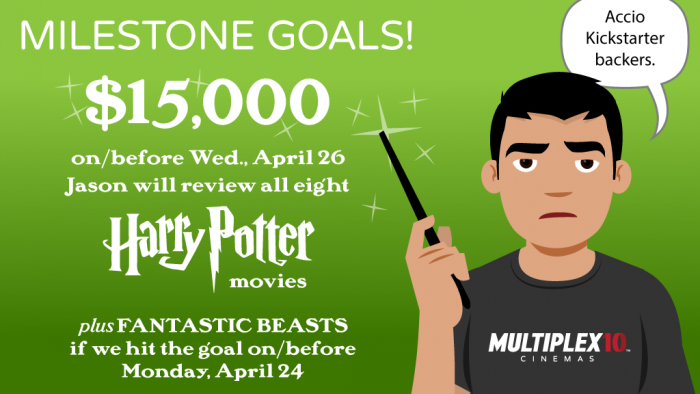 BUT don’t forget that we still have a milestone goal of Jason reviewing every Harry Potter movie if we make that $15,000 baseline goal on/before Wednesday, April 26th, though! (Plus Fantastic Beasts if we make it on/before Monday, April 24th. But that seems kind of unlikely at this point.) I thought that was a fun premise… but it’s up to the Gods of Kickstarter now. Pledge your support today! If you haven’t already! In case you missed it… in order to — fingers crossed — hit the Multiplex 10: the animated short’s base goal sooner rather than later, if we can reach $15,000 on or before Wednesday, April 26 (according to Eastern Daylight Time), I’ll write and draw Multiplex Movie Review comics for all eight of the Harry Potter movies. And if we do it on or before Monday, April 24, I’ll throw in Fantastic Beasts, as well. 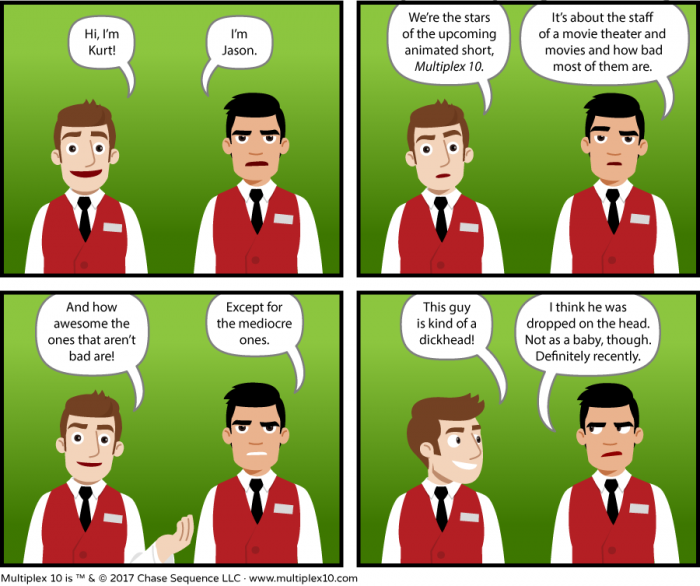 These strips will be different than previous review comics, though: Jason will review them at the age he was when each movie was released. So the first ones will be set before the comic strip began, and we’ll get a glimpse of his life before the Multiplex 10, then see him get older with each new movie along with the characters in the movies, etc.